To Cite: Imani M M, Farzaneh S, Ghanbari A, Arab S. Cephalometric Norms in an Iranian Kurdish Population According to the Steiner Analysis, Iran J Ortho. 2019 ; 14(1):e63439. doi: 10.5812/ijo.63439. Background: Cephalometric analyses norms and orthodontic software have been mainly developed for Caucasians. Thus, they might not be true for other ethnical groups. Objectives: This study sought to determine cephalometric norms of an Iranian Kurdish population according to Steiner analysis. Methods: In this cross-sectional study, 100 lateral cephalograms of adult orthodontic patients between 18 - 30 years including 40 males and 60 females with normal occlusion and symmetrical faces were evaluated. Lateral cephalograms were traced and analyzed based on Steiner’s cephalometric parameters. Data were analyzed using SPSS. Differences between Kurdish and Caucasian norms were analyzed using one-sample t-test. Independent t-test was used to compare males and females (P < 0.05). 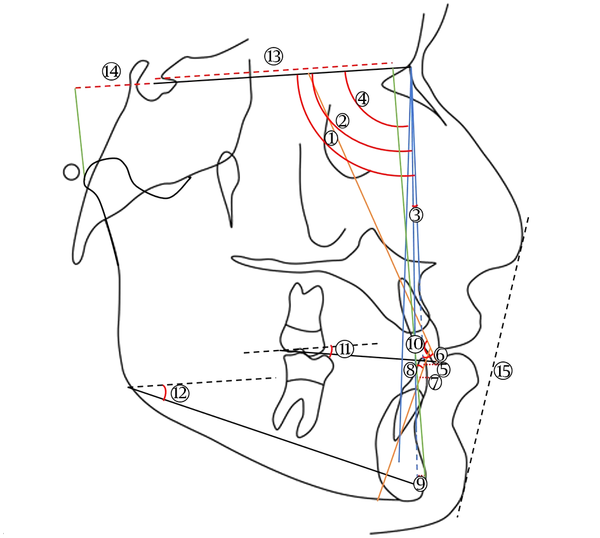 Results: The SNA, SNB, ANB, SND (Sella-Nasion-D point), interincisal angle, GoGn-SN L1-NB (both angular and linear measurements), SL (distance from Sella point to L, which is the projection of the most-anterior point in the body of mandible or pogonion on SN and SE (distance from Sella point to E point, which is the intersection of a line drawn from the most distal limit of the posterior surface of condyle head and SN) values were significantly different between the Kurdish population and Caucasian norms (P < 0.05). No significant differences existed in Occl-SN (occlusal plane to SN) and U1-NA (both angular and linear measurements) between the Kurdish population and the Caucasians (P > 0.05). Kurdish males and females were significantly different in terms of SND, Occl-SN, GoGn-SN and U1-NA angles, U1-NA distance and SL and SE values (P < 0.05). No significant difference existed between Kurdish males and females in SNA, SNB, ANB, interincisal angle and L1-NB (P > 0.05). Conclusions: Cephalometric norms for Kurdish adults are different from those of Caucasians. The norms obtained in our study can be used for orthodontic treatments and orthognathic surgeries in Kurdish population. Orthodontic treatment is performed to provide stable occlusal relationships, optimal masticatory function and favorable esthetics. Orthodontic treatment often includes diagnosis, prevention and correction of dental and skeletal discrepancies. An accurate diagnosis is the backbone of a correct treatment plan which requires thorough assessment of craniofacial morphology (1). The basis of orthodontic diagnosis and treatment planning is the information collected by history taking, clinical examination, and assessment of study models (dental casts), extra-oral and intra-oral radiographs and photographs. Lateral cephalometry has long been one the main diagnostic records for orthodontic diagnosis and treatment planning. Lateral cephalograms are obtained to evaluate deviation from the normal craniofacial anatomy, estimation of the magnitude and direction of growth of maxillofacial complex, assessment of the efficacy of treatment, and comparison of the results of different treatment modalities (2). Cephalometry is a reliable and valid diagnostic modality, by which the anatomical parameters of patients are compared with normal range of values and the target components are corrected based on cephalometric norms in order to reach a better facial balance and harmony (3). Following the introduction of cephalometry by Broadbent in 1931, several cephalometric analyses were developed, among which the Downs, Steiner, Tweed and Ricketts are the most popular and commonly used ones by orthodontists (4). Cephalometric analyses have been primarily developed based on data obtained from normal European-American populations, yet these normal values are used as reference norms for assessment of craniofacial patients from other racial groups. The same is rather true about Steiner analysis (5). Since diagnosis and consequently treatment planning are performed based on comparison of cephalometric parameters of patients with the reference values, and considering that cephalometric norms could be dissimilar in different populations, norms specific for one population cannot be generalized to others (6). This is due to skeletal, soft tissue and dental differences between people of different races and ethnic groups (7). Previous studies showed that cephalometric norms are specific for each race (8-10), as significant differences have been noted between cephalometric norms of Caucasians and those of Indians (11), Tamils (12), Arabs (13), Nepalese (14), Turkish (15), Japanese (16), Chinese (17), Korean (6), Pakistani (18) and African (19) populations. These differences should be taken into account in orthodontic diagnosis and treatment planning as well as in orthognathic surgery. The same standard norms cannot be used for different populations and it is necessary to determine cephalometric norms and standards specific for each population. Several racial and ethnic groups reside in different parts of Iran. The Kurds are an ethnic group in the Middle East mainly inhabiting an area spanning adjacent parts of southeastern Turkey, western Iran, northern Iraq and northern Syria. They are estimated to number about 50 million (20). Cephalometric norms have been evaluated in Iranians residing in Isfahan (21), Mashhad (22), Babol (23) and Hamadan (24). However, to our knowledge, cephalometric norms of Kurdish population residing in west and north-west of Iran have not been previously established. This study sought to determine cephalometric norms in an Iranian Kurdish population according to the Steiner analysis. Cephalometric norms were compared with widely used Caucasian norms. In this cross-sectional study, lateral cephalograms of 100 adult Kurds presenting to the Orthodontic Department of Kermanshah University of Medical Sciences and a private orthodontic office were evaluated. The study protocol was approved in the Ethics Committee of Kermanshah University of Medical Sciences (code: REC.7395.394). Sample size was calculated based on a previous study (25). The inclusion criteria were: Age between 18 - 30 years, Kurdish ethnicity (mother, father and grandparents must have been Kurds and spoken the language), facial symmetry and normal soft tissue profile, complete eruption of permanent teeth and class I occlusion. The exclusion criteria were: Malocclusion, dental crowding (except for mild cases), spacing by more than 3 mm (26), tooth loss/missing except for third molars, horizontal or vertical jaw discrepancy, history of orthodontic treatment, dental/facial prosthesis, history of maxillofacial surgery and history of facial trauma. Based on the inclusion and exclusion criteria, 100 lateral cephalograms were chosen from the archives of the Orthodontic Department of Kermanshah University of Medical Sciences and a private orthodontic office including 40 males and 60 females. All cephalograms had been taken by the same dental X-ray unit (Planmeca, Helsinki, Finland) under similar conditions with teeth in centric occlusion. All cephalograms were manually traced. An experienced orthodontist measured SNA, SNB, ANB , SND, interincisal angle, Occl-SN, GoGn-SN, U1-NA and L1-NB angles, U1-NA and L1-NB distances (in millimeters) and SL (distance from Sella point to L, which is the projection of the most-anterior point in the body of mandible or Pogonion on SN line) and SE (distance from Sella point to E point, which is the intersection of a line drawn from the most distal limit of the posterior surface of condyle head and SN). Figure 1 shows all the linear and angular measurements. Each parameter was measured in triplicate and the mean value was recorded. The inter-examiner reliability was assessed using inter-class correlation coefficient and the kappa value (correlation coefficient) was found to be 98%, which indicated excellent inter-examiner reliability. Figure 1. Schematic view of the cephalometric measurements made in our study. (1) SNA (angle), (2) SNB (angle), (3) ANB (angle), (4) SND (angle), (5) upper incisor to NA (linear), (6) upper incisor to NA (angle), (7) lower e incisor to NB (linear), (8) lower incisor to NB (angle), (9) Pog to NB (linear), (10) upper incisor to lower 1 (angle), (11) occlusal plane to SN (angle), (12) Go-Gn to SN (angle), (13) SL (linear), (14) SE (linear) and, (15) soft tissue line. The data were analyzed using SPSS version 18 (SPSS Inc., IL, USA). Descriptive statistics including the mean and standard deviation values were reported. The mean values of cephalometric parameters according to the Steiner analysis in the Kurdish population were compared with the Caucasian norms using one-sample t-test. Independent t-test was used to compare the cephalometric values between Kurdish males and females. P < 0.05 were considered statistically significant. Table 1 shows the comparison of cephalometric parameters according to the Steiner analysis in our Kurdish population with the Caucasian norms. In our Kurdish population, the mean values of SNA (81.3 ± 3.4°, P = 0.034), SNB (77.0 ± 7.8°, P < 0.001), SND (75.3 ± 3.5°, P < 0.001), interincisal angle (124.9 ± 11.7°, P < 0.001) and GoGn-SN (30.4 ± 6.1°, P = 0.012) were significantly smaller than the Caucasian norms. The mean ANB (3.8 ± 2.9°, P < 0.001) and L1-NB (28.4 ± 6.5°, P < 0.001) values in our Kurdish population were significantly greater than the corresponding values in Caucasians. The Occl-SN (14.8 ± 4.6°, P = 0.079), U1-NA angle (P = 0.299) and U1-NA distance (3.5 ± 2.6 mm, P = 0.078) were not significantly different between our Kurdish population and Caucasians. The mean L1-NB angle (28.4 ± 6.5) and distance (5.1 ± 2.5 mm) were significantly greater in our Kurdish population compared to the value in Caucasians (P < 0.001). In addition, the mean SL (47.9 ± 10.6 mm, P = 0.004) and SE (20.4 ± 3.4 mm, P < 0.001) values were significantly smaller than these values in Caucasians. Table 2 compares cephalometric parameters according to the Steiner analysis between Kurdish males and females. As shown in Table 2, Kurdish males and females were not significantly different in terms of SNA (P = 0.065), SNB (P = 0.988), ANB (P = 0.244), interincisal angle (P = 0.197) and L1-NB (P = 0.879). However, the mean SND (P = 0.029) and U1-NA (P = 0.044) angles were significantly greater in Kurdish males than females while Occl-SN (P < 0.001) and GoGn-SN (P < 0.001) were significantly smaller in males than females. The mean distance of U1-NA was greater in Kurdish males than females (P = 0.048) while they were not significantly different in terms of L1-NB distance (P = 0.199). Kurdish males had significantly greater SL (P = 0.005) and SE (P = 0.011) values than females. Cephalometric studies on non-Caucasian populations have indicated skeletal and dental differences in comparison with Caucasians. Therefore, cephalometric norms of one population cannot be used as reference for other populations. To obtain cephalometric norms of Kurdish population, we only included normal occlusion individuals with harmonic faces with no history of facial trauma or surgery. Our results showed that SNA and SNB angles were significantly smaller in our Kurdish population compared to the Steiner norms, which indicates more retruded position of the maxilla and mandible. Kurdish population showed retrusion of both jaws in contrast to Saudi Arabian populations. According to Al-Jasser (27), these two parameters in the Saudi Arabian population are larger than the corresponding values in Caucasians and thus, Saudi Arabians have maxillary and mandibular protrusion compared to the American-European populations. The ANB angle was significantly greater in our Kurdish population compared to Caucasians, which suggests more acceptable convexity in Kurds compared to Caucasians. Comparison of normal ANB angles between Kurdish population and Caucasians (3.8° versus 2.0°, respectively) indicates that what we recognize as mild skeletal class II in Caucasians is considered as normal in Kurds. The ANB angle in Japanese population with normal occlusion was reported to be 2.5 to 4.5° (16) which was closer to Kurds. Hussien et al. (28) showed that the value of ANB angle in Palestinians (2.7°) was close to that in Caucasians. This value was reported to be 2.5° in Saudi Arabians (27). Comparison of the before-mentioned results shows that normal value of ANB is somewhat different in various races. The interincisal angle in our Kurdish population was significantly smaller than the Steiner norm, which indicates dentoalveolar protrusion. This finding is in agreement with the findings of Al-Jasser (27), who reported smaller interincisal angle in Saudi Arabians compared to Caucasians. In terms of Occl-SN angle, no significant difference was noted between Kurds and the norms reported by Steiner. Al-Jasser (27) measured the Occl-SN angle in a Saudi Arabian population and showed that the value was close to that of Steiner norm, which was similar to our finding in this respect. Hussien et al. (28) reported this value to be higher in Palestinians compared to Caucasians. Despite Occl-SN, GoGn-SN was significantly smaller in Kurdish population. Evaluation of Occl-SN and GoGn-SN altogether reveals that Kurds have a mild tendency to short face in comparison to Caucasians. The mean L1-NB angle of our samples (28.3 ± 5.8) showed greater labial inclination of mandibular incisors in Kurds than in Caucasians. This parameter was almost similar to L1-NB angle in Saudi Arabians (27.8°) (27). The mean L1-NB angle was 26.5° in Palestinians (28) while Anderson et al. (29) reported this value to be 33.9° in an African-American of 6 - 12 years old population. Based on the value of U1-NA distance, no significant difference existed between our Kurdish population and Caucasians in terms of position of upper incisors. In our study, no significant differences were noted in SNA and SNB angles between males and females, which was in line with the results of Hussien et al. (28) on Palestinians. Gu et al. (17) in their study on Chinese adults found no significant difference in SNA between males and females but males had a slightly larger SNB angle than females. In our study, the difference in ANB angle between males and females was not significant, which was in line with the results of Gu et al. (17). Hussien et al. (28) also reported similar ANB values between males and females. In our Kurdish population, U1-NA distance was larger in males than females, which indicates greater upper incisor protrusion in males, which was in contrast to the findings of Hussien et al. (28) since they found no significant differences between males and females in terms of U1-NA distance. To our knowledge, our study was the first to assess cephalometric norms according to the Steiner analysis in a Kurdish population and yielded values that can be used as cephalometric norms for orthodontic treatments and orthognathic surgeries in this population. Future studies with larger sample sizes are required on this population using other commonly used cephalometric analyses. Our results showed that some Steiner’s cephalometric norms in Iranian Kurds are different from Caucasians. Significant differences also exist between Kurdish males and females in some cephalometric parameters. Conflict of Interests: The authors declare that there is no relevant financial interests about the submitted manuscript within the past 5 years and for the foreseeable future. Financial Disclosure: The authors declare that there is no relevant financial conflicts about the submitted manuscript within the past 5 years and for the foreseeable future. Funding/Support: This research was funded by deputy of research of Kermanshah University of Medical Sciences. 1. Haring LL. Dental radiography principle and techniques. 2nd ed. PhLadelphia: W.B. Saunders; 2000. 2. Dincer B, Yetkiner E, Aras I, Attin T, Attin R. Influence of lateral cephalometric radiographs on extraction decision in skeletal class I patients. Head Face Med. 2013;9:36. doi: 10.1186/1746-160X-9-36. [PubMed: 24304887]. [PubMed Central: PMC3932141]. 3. Taki AA, Oguz F, Abuhijleh E. Facial soft tissue values in Persian adults with normal occlusion and well-balanced faces. Angle Orthod. 2009;79(3):491-4. doi: 10.2319/020408-62.1. [PubMed: 19413374]. 4. McNamara JA Jr. A method of cephalometric evaluation. Am J Orthod. 1984;86(6):449-69. doi: 10.1016/S0002-9416(84)90352-X. [PubMed: 6594933]. 5. Al Zain T, Ferguson DJ. Cephalometric characterization of an adult Emirati sample with class I malocclusion. J Orthod Sci. 2012;1(1):11-5. doi: 10.4103/2278-0203.94772. [PubMed: 24987619]. [PubMed Central: PMC4072350]. 6. Hwang HS, Kim WS, McNamara JA Jr. Ethnic differences in the soft tissue profile of Korean and European-American adults with normal occlusions and well-balanced faces. Angle Orthod. 2002;72(1):72-80. doi: 10.1043/0003-3219(2002)072<0072:EDITST>2.0.CO;2. [PubMed: 11843277]. 7. Altemus LA. A comparison of cephalofacial relationships. Angle Orthod. 1960;30(4):223-40. 8. Alcalde RE, Jinno T, Pogrel MA, Matsumura T. Cephalometric norms in Japanese adults. J Oral Maxillofac Surg. 1998;56(2):129-34. doi: 10.1016/S0278-2391(98)90849-7. [PubMed: 9461133]. 9. Craven AH. A radiographic cephalometric study of the Central Australian Aboriginal. Angle Orthod. 1958;28(1):12-35. 10. Hajighadimi M, Dougherty HL, Garakani F. Cephalometric evaluation of Iranian children and its comparison with Tweed's and Steiner's standards. Am J Orthod. 1981;79(2):192-7. doi: 10.1016/0002-9416(81)90317-1. [PubMed: 6937142]. 11. Atit MB, Darda M, Deshmukh SV, Naik C, Rahalkar J, Subramanian V. Mean values of Steiner, Tweed, Ricketts and McNamara analysis in Maratha ethnic population: A cephalometric study. APOS Trends Orthod. 2013;3(5):137. doi: 10.4103/2321-1407.119095. 12. Nachiappan S, Tharanikumar S, Chandran A, Anusudha P, Nandini GD, Balasubramaniam M. A study to evaluate cephalometric hard tissue profile of Tamil population for orthognathic surgery. J Pharm Bioallied Sci. 2015;7(Suppl 2):S680-6. doi: 10.4103/0975-7406.163600. [PubMed: 26538943]. [PubMed Central: PMC4606685]. 13. Hassan AH. Cephalometric norms for saudi adults living in the western region of Saudi Arabia. Angle Orthod. 2006;76(1):109-13. doi: 10.1043/0003-3219(2006)076[0109:CNFSAL]2.0.CO;2. [PubMed: 16448278]. 14. Sharma JN. Steiner's cephalometric norms for the Nepalese population. J Orthod. 2011;38(1):21-31. doi: 10.1179/14653121141209. [PubMed: 21367825]. 15. Kilic N, Catal G, Oktay H. McNamara norms for Turkish adolescents with balanced faces and normal occlusion. Aust Orthod J. 2010;26(1):33-7. [PubMed: 20575197]. 16. Ioi H, Nakata S, Nakasima A, Counts AL. Comparison of cephalometric norms between Japanese and Caucasian adults in antero-posterior and vertical dimension. Eur J Orthod. 2007;29(5):493-9. doi: 10.1093/ejo/cjm059. [PubMed: 17974539]. 17. Gu Y, McNamara JA Jr, Sigler LM, Baccetti T. Comparison of craniofacial characteristics of typical Chinese and Caucasian young adults. Eur J Orthod. 2011;33(2):205-11. doi: 10.1093/ejo/cjq054. [PubMed: 20709723]. 18. Khan T, Ahmed I, Gul e E. Cephalometric measurments of a Pakistani adult sample according to Jarabak's analysis. J Pak Med Assoc. 2013;63(11):1345-8. [PubMed: 24392516]. 19. Fadeju AD, Otuyemi OD, Ngom PI, Newman-Nartey M. A study of cephalometric soft tissue profile among adolescents from the three West African countries of Nigeria, Ghana and Senegal. J Orthod. 2013;40(1):53-61. doi: 10.1179/1465313312Y.0000000033. [PubMed: 23524548]. 20. Gunter MM. Kurdish awakening: Nation building in a fragmented homeland. Middle East Q. 2015;22:3. 21. Azarbayejani S, Omrani A, Kalaantar-Motamedi A, Abdellahi M, Taalebi V, Teimoori F. Cephalometric norms for 6-17 year-old Iranians with normal occlusion and well-balanced faces. Dent Res J (Isfahan). 2014;11(3):327-35. [PubMed: 25097642]. [PubMed Central: PMC4119365]. 22. Basafa M, Shahri F. cephalometric analysis of mashhad children based on "natural head position". J Mashhad Dent Sch. 2007;31:4-8. 23. Arash VA, Shahabi M. [Cephalometric survey of 12-18 year old adolescents with normal occlusion (Babol)]. J Babol U Med Sci 2004. 2004;6:45-8. Persian. 24. Farhadian N, Miresmaeili AF, Mahjoub H. [Check cephalometric standards for female students with normal occlusion in Hamedan 1378-1379 academic year]. Sci J Hamdan Univ Med Sci. 2003;10:43-6. Persian. 25. Tenti FV. Cephalometric analysis as a tool for treatment planning and evaluation. Eur J Orthod. 1981;3(4):241-5. [PubMed: 6945994]. 26. Al-Khawaja NFK, Kadhom ZM, Al-Tuma RR. Soft tissue cephalometric norms for a sample of iraqi population group using legan and burstone analysis. Kerbala J Med. 2015;8(2):2222-8. 27. Al-Jasser NM. Cephalometric evaluation for Saudi population using the Downs and Steiner analysis. J Contemp Dent Pract. 2005;6(2):52-63. [PubMed: 15915204]. 28. Hussien E, Al-Khateeb S, Mowais MA. Palestinians norms of Steiner cephalometric analysis. World J Orthod. 2010;11(4):e5-9. [PubMed: 21490988]. 29. Anderson AA, Anderson AC, Hornbuckle AC, Hornbuckle K. Biological derivation of a range of cephalometric norms for children of African American descent (after Steiner). Am J Orthod Dentofacial Orthop. 2000;118(1):90-100. doi: 10.1067/mod.2000.103258. [PubMed: 10893478].